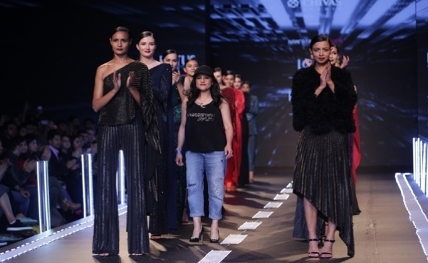 New Delhi, March 16 : It was all about women for designer Namrata Joshipura, who showcased her autumn/winter line titled ‘Blend Out’ at the ongoing Lotus Make-Up India Fashion Week here. With over 20 exuberant ensembles, Joshipura presented a ravishing range of gowns, jumpsuits and pantsuits in shades greys, black, blues, greens and reds. Talking about her collection, Joshipura said: "The inspiration was a collection for women by a women… and can wear these in all facets of life like office wear and evening wear." She brought the curtains down for the day three of the fashion extravaganza, which will conclude on Saturday. Other designers who are yet to showcase their collection at the event are Siddartha Tytler, Rohit Kamra, Kommal Sood, Pawan Sachdeva and Karishma Deepa Sindhi among many others. The grand finale will be held on Saturday night, where a string of designers will pay an ode to sari. The sari, its multiplicity and its personality will be celebrated by designers Akaaro, Alpana & Neeraj, Amit Aggarwal, Anamika Khanna, Anavila, Anita Dongre, Bodice, Gaurav Gupta, Little Shilpa, Neeru Kumar, Pankaj & Nidhi, Payal Khandwala, Prashant Verma, Raw Mango, Rimzim Dadu, Rohit Bal, Tarun Tahiliani, Urvashi Kaur and Wendell Rodricks. The gala will also see a collection made by the students of the fashion institute Pearl Academy on Sunday.